Celebrating his 30 year anniversary with Melbourne Theatre Company, Richard Piper talks to Sarah Corridon about MTC in the 1980s, and what it means to be a gentleman of the theatre. ‘The porchlight, the torchlight, the frosted morning lawn, the cloak of daylight has finally been drawn on the tale of what the butler saw.’ Richard Piper’s first role at Melbourne Theatre Company was precisely thirty years ago in a 1987 production of What the Butler Saw. Since his professional theatre debut in Australia, Richard has gone on to appear in dozens of plays for the Company, in both ensemble parts and leading roles. ‘What’s happened to the time?’ he asks me curiously, before affirming that most people, in most industries, would probably feel a similar bewilderment when asked to reflect on the last three decades of their career. When you spend your life in and out of costumes, characters and theatres all over the country (and world), 30 years is measured in productions, more so than years. Richard spent the first part of his life in England, before travelling to Melbourne at the age of 32. His last five years on home soil were spent touring the UK in a successful, alternative rock-cabaret band called the Bouncing Czecks. ‘We had no money and no hits, and we behaved outrageously,’ he tells me. 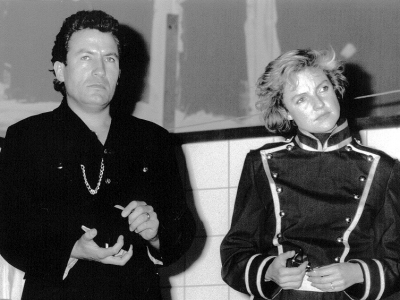 Richard Piper playing Sergeant Match alongside Geneveive Mooy playing Geraldine in What the Butler Saw, 1987. Richard credits Roger and Simon with keeping him in the country and reflects on his early days at MTC’s Russell Street Theatre as a halcyon time of life. What is now a derelict shell, once stood as the thumping heartbeat of Melbourne’s drama community, and became a home away from home for the English expatriate. ‘This was an extraordinary hub of activity – this tiny, grubby little theatre, where the stage door was down an alley,’ he says. ‘Theatre was incredibly spontaneous in those days. There wasn’t as much occupational health and safety. At that point in time, MTC operateed as a repertory theatre company. Meaning Richard and his peers could be rehearsing in as many as two plays throughout the day and performing in two at night. 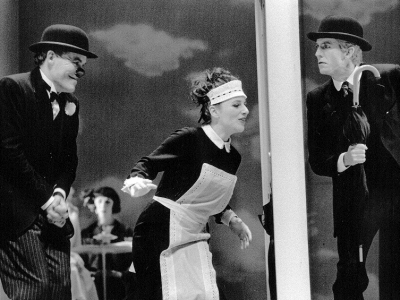 Richard Piper alongside Merridy Eastman and Robert Menzies in The Comedy of Errors, 1997. A list of Richard’s theatre credits spans many pages, with major productions for other leading theatre companies scattered between his appearances at MTC. 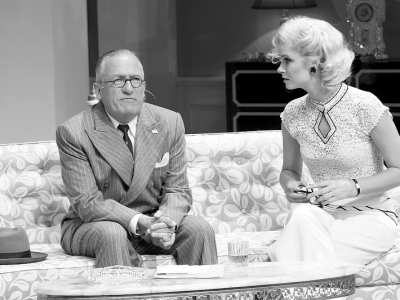 Richard’s role in Sydney Theatre Company’s Gross und Klein and Belvoir’s The Wild Duck lead to tours through Europe, which took Richard back to his birthplace where it all began. Amoungst this substantial list, is it possible for Richard to pick favourites? I ask. Richard remembers there being a magic about Life after George, which he recalls Melbourne responding to accordingly. 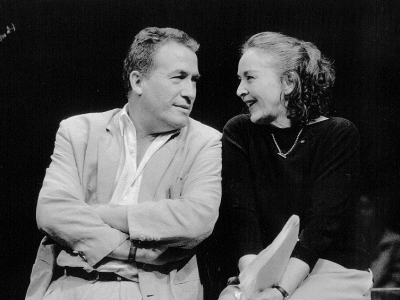 Richard Piper alongside Sue Jones in Life After George, 2001. Richard admits it’s hard to know what to do after a performance of this nature. In the one-man show, directed by Simon Phillips, The Daylight Atheist, he considered the possibility of retiring. ‘Here I was for two hours playing a Belfast Irishman in New Zealand and it was the kind of experience where afterwards you take a deep breath and think, well I could retire…what else do you do?’ he asks. The role earned Richard a Green Room Award for Best Actor in a Leading Role. Riper Piper alongside Christie Whelan Browne in Born Yesterday, 2017.